The timeline of Lucy’s first days on earth can only be described as a nightmare - each passing hour brought more devastating, gut-wrenching news. 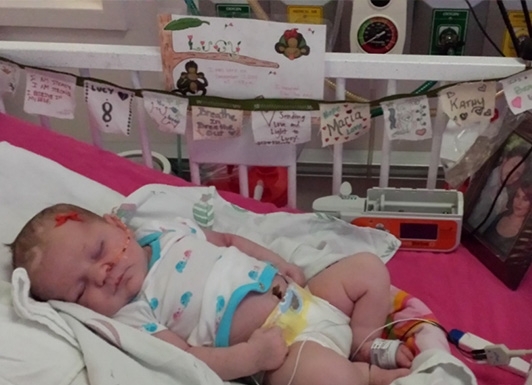 Within 24 hours of her birth, she was barely opening her eyes and refused to nurse. Within 36 hours, she was transferred to the NICU after becoming unresponsive and showing signs of seizure. At 5 days old, she was intubated and in a comatose state. 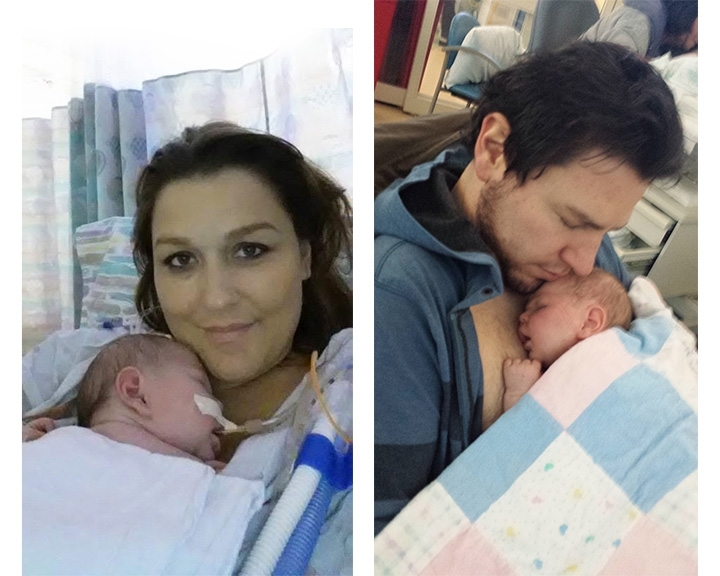 When Lucy was 9 days old, Grace and Stephen finally received seemingly good news - Lucy was beginning to take her own breaths and would no longer need to be intubated. However, despair still loomed... there were still signs of seizure activity. Additionally, Lucy would not open her eyes or make a sound. The local physicians of Reno, NV were at a complete loss. Lucy’s condition was unlike any they had ever encountered. As a result, their efforts to provide an accurate diagnosis were futile. 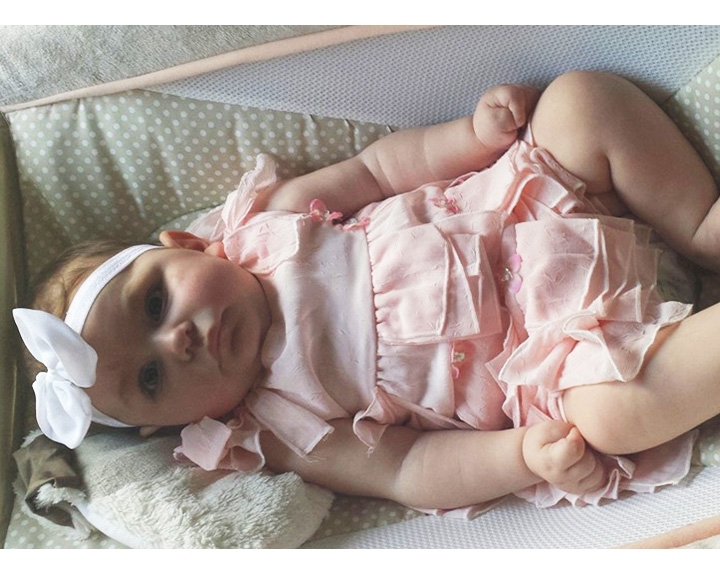 At 3 weeks old, Lucy was careflighted to Lucile Packard Children’s Hospital Stanford in Palo Alto, CA. Almost immediately, the medical director suspected a rare genetic disorder - a disorder so rare that it had been decades since he had seen another neonatal case. 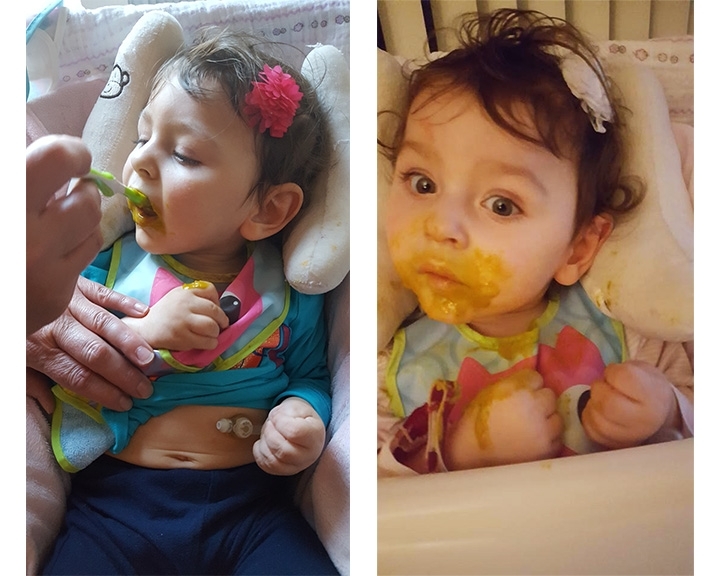 His suspicions were confirmed with blood and genetic testing and Lucy was diagnosed with Nonketotic Hyperglycinemia (NKH). NKH is a rare and currently incurable genetic disorder which restricts the body from breaking down the key amino acid glycine. Glycine helps to connect signals from one brain cell to another. Excessive glycine severely disrupts the function of the brain resulting in uncontrolled seizures, low tone, and profound learning and developmental disabilities. Deemed somewhere within the ‘very affected’ to ‘severe’ spectrum of this disorder, Lucy’s prognosis was grim. In fact, Lucy’s parents were told that Lucy’s condition was ‘as bad as it gets’. 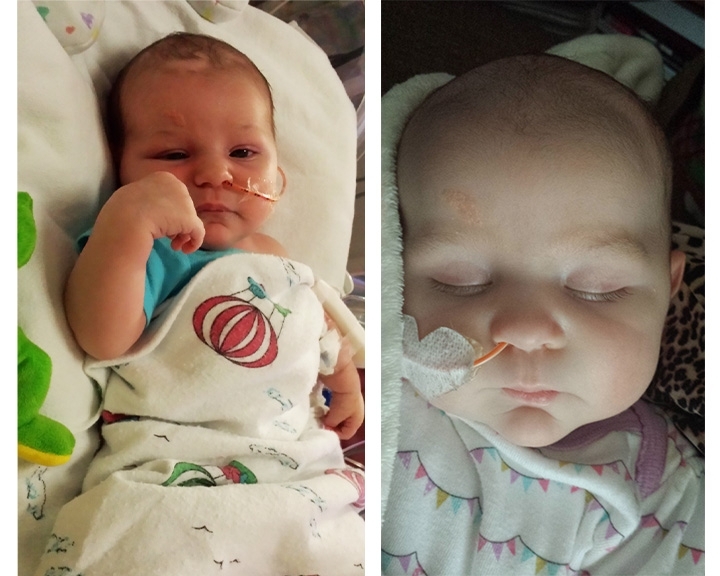 Learning that there is no meaningful treatment for NKH, Grace and Steven were further devastated to discover that many babies diagnosed with NKH pass during the first weeks of life due to loss of respiratory function. Lucy had already done the unimaginable by conquering the devastating disease for three weeks. However, even if she continued to evade death, her quality of life would be “inevitably tragic.” She wouldn’t smile or recognize people. She would likely be blind, or near. She would need to be tube fed and would be plagued with respiratory problems. It was suggested to Grace and Stephen that rather than treat Lucy they let her go. But, for Grace and Stephen that was not an option. Inspired by their daughter’s unwavering determination for each breath that entered her lungs, they resolved to fight for her, every single day of their lives. 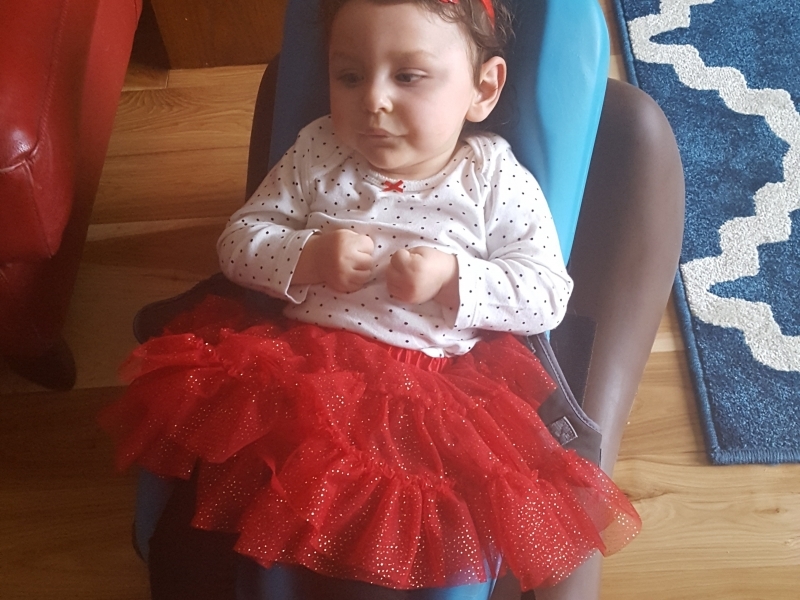 Less than a month after receiving her diagnosis, Lucy was discharged from the hospital, and Grace and Stephen were told that arrangements were being made to place Lucy on hospice. Exhausted and terrified, the new parents loaded their fragile baby and her feeding pump into the car and headed home to Reno. They pulled over so often for seizures, medications, and tube feedings that the 5 hour drive took almost 10 hours. However, something remarkable happened on this road trip: Lucy cried. They heard their daughter’s voice for the first time since she came into the world. 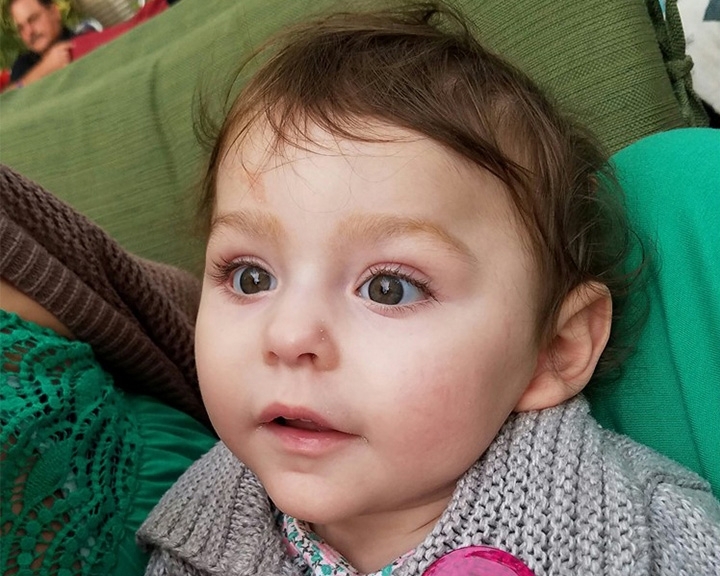 As first-time parents, Stephen and Grace spent much of Lucy’s first year scrambling to understand this very rare disease, new medical terminology, and a complicated medication rotation. Their knowledge of and experience with NKH far surpassed that of any local medical professionals. Not only did they become experts on the disease, but they also became experts on their daughter. It became abundantly evident to them just how resilient Lucy was as she refused to succumb to horrific diagnosis. Her resilience was affirmed when at 10 months old Lucy graduated from hospice! The delicate pink ruffles she wore on the day of her graduation perfectly complimented her warrior spirit as friends and family gathered to celebrate her miraculous milestone. On the heels of her graduation, Lucy astounded everyone by doing the impossible again - she smiled! This wasn’t just a single smile - a small glitch - it was an intentional grin! Nestled in her parents arms, Lucy smiled as Grace and Stephen cried. The countless tears of frustration and devastation Grace and Stephen shed throughout the precarious first months of Lucy’s life paled in comparison to the tears of joy that fell as they watched their daughter smile for the very first time. To this day, Lucy continues to astound her doctors and therapists with her accomplishments. However, Lucy still has a long road ahead of her. She receives liquid medication every 4 hours around the clock, has daily uncontrolled seizures, and profoundly low tone. Currently, Lucy’s goals include engaging her arms in order to eventually bear her own body weight. She is also working on taking advantage of the strength she has in her legs. In order for Lucy to continue to make progress, she works with developmental, physical, nutritional, occupational, and music therapists weekly. There are also specific pieces of equipment that can be invaluable to her and her progress, but these resources come with a hefty price tag. Chive Charities, in their commitment to seeing the underdogs succeed, refused to let something as insignificant as money interfere with Lucy’s success. Therefore, because of the generosity of our monthly donors, Lucy received a $3,400 grant for her specialized mobility and therapy equipment. 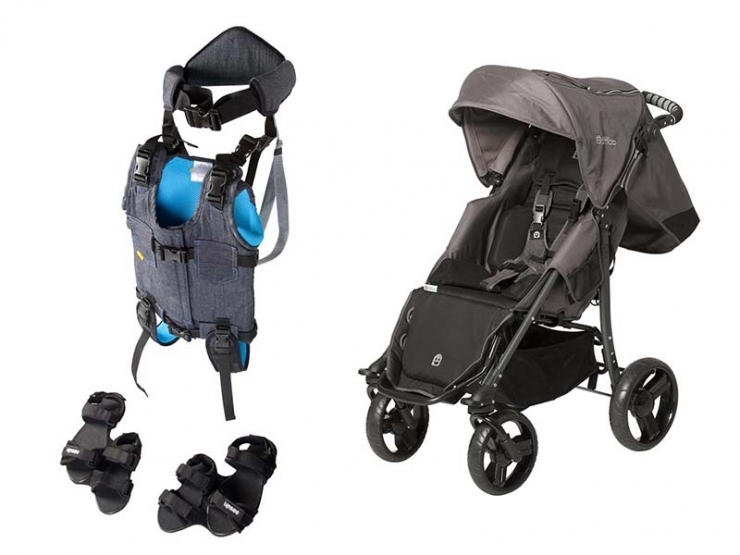 Both the Upsee Kit and EIO Push Chair (pictured above left to right) will aid Lucy’s mobility. The Upsee Kit will allow Lucy to stand and walk with the help of an adult. Lucy not only wants to walk, but also is actively trying to take her first steps. The kit will ensure that she can accomplish her goal. Thankfully, Lucy is growing beautifully. As a result, she has outgrown her infant stroller. The EIO push chair will make transport, walks, and overall life more portable, functional and fun. Both mobility items will help give Lucy the independence that she wants and deserves! 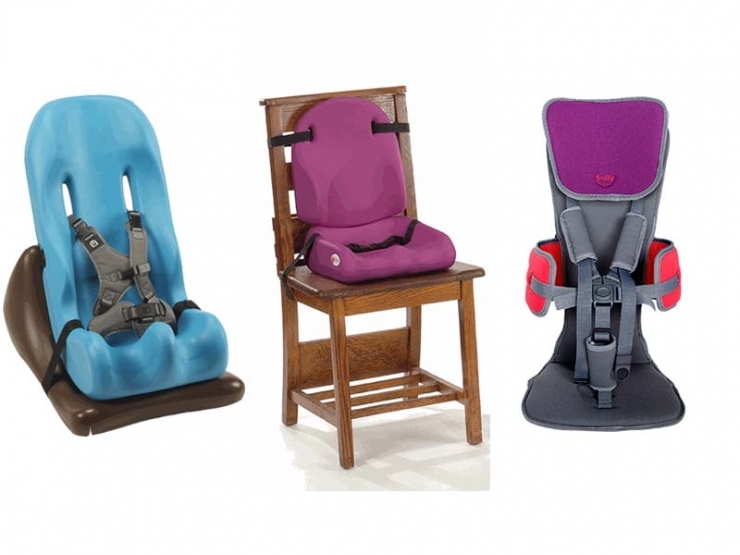 The Soft-Touch Floor Sitter, Headrest, and Activity Tray; Soft-Touch Liner; and GoTo Seat with Advanced Head Support (pictured above left to right) will provide Lucy support and give her parents peace of mind as she grows. In addition to providing safety, they will aid her posture during feedings, important learning activities, and getting around outside the house. Lucy loves the water, and she loves to take baths. She is currently bathed in the kitchen sink using an infant-sized tub, which she outgrew long ago. With the Blue Wave Bath Chair (pictured above) baths will no longer be a messy, wet ordeal. Grace and Stephen believe in miracles and breakthroughs, both in the medical field and in their own lives. Lucy is a testament to the power of their belief. Chive Charities is grateful to be a small part of Lucy’s remarkable journey. There is no greater honor than to help ensure that this beautiful little girl has a reason to smile each and every hard-earned day of her precious life. Thank you to our members that make miracles happen through their monthly donations. 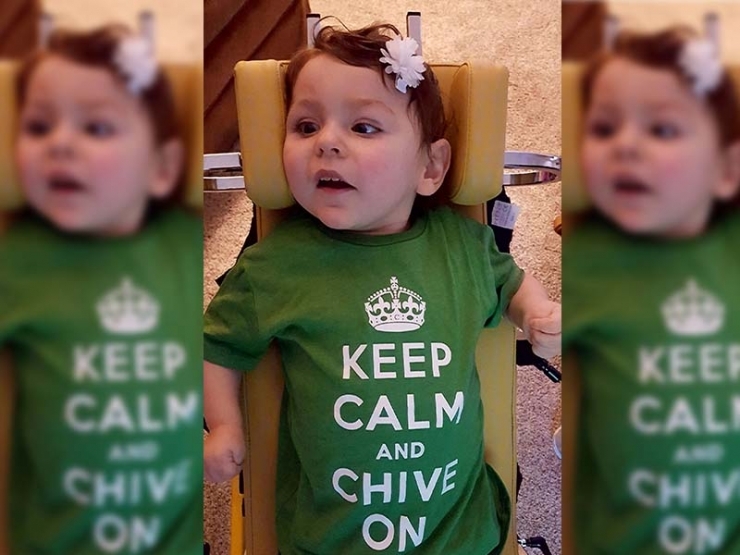 Join the Chive Charities family HERE. Watch Lucy’s progress on her Youtube channel HERE. Learn more and join the crusade against NKH HERE.